Punta Cana is a beautiful destination to explore and is ideal for those travelers who love warm weather and long white sand beaches. 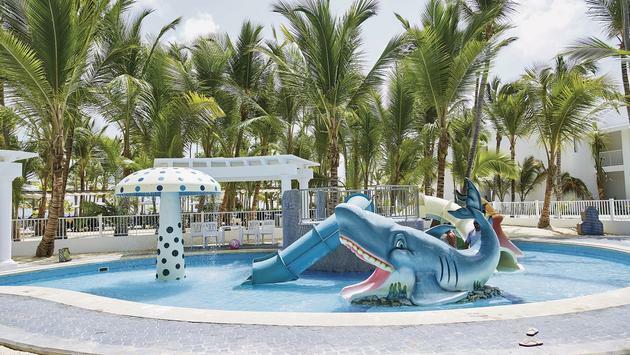 RIU Bambu hotel by RIU Hotels & Resorts is located on the gorgeous Arena Gorda beach and is a perfect spot for a family-friendly or an adult only getaway. This property was recently renovated and now offers even more fun for all different ages to enjoy. The kiddos will enjoy spending their days at RIULand, a kid’s club on property. They can have fun in the pools or get out of the sun to enjoy indoor activities. It’s a great way for them to meet friends of similar ages. After graduating from this area, teenagers between 13 and 17 will prefer to participate in the RIU4U program instead. There are plenty of areas to make a splash during a stay at RIU Bambu. This property boasts five swimming pools—two of which are especially for children. All ages will want to enjoy the all-new Splash Water World aquatic park. Here visitors can use the slides, high-speed lanes and more. For the couples and adult groups traveling, RIU Bambu offers pool parties and plenty of bars on property. Two of the six bars are swim-up. There is also wifi available for those who need to stay connected to work or other obligations. From young to old and all ages in between, this resort has activities for all to enjoy. Visit RIU Bambu’s website to learn more.